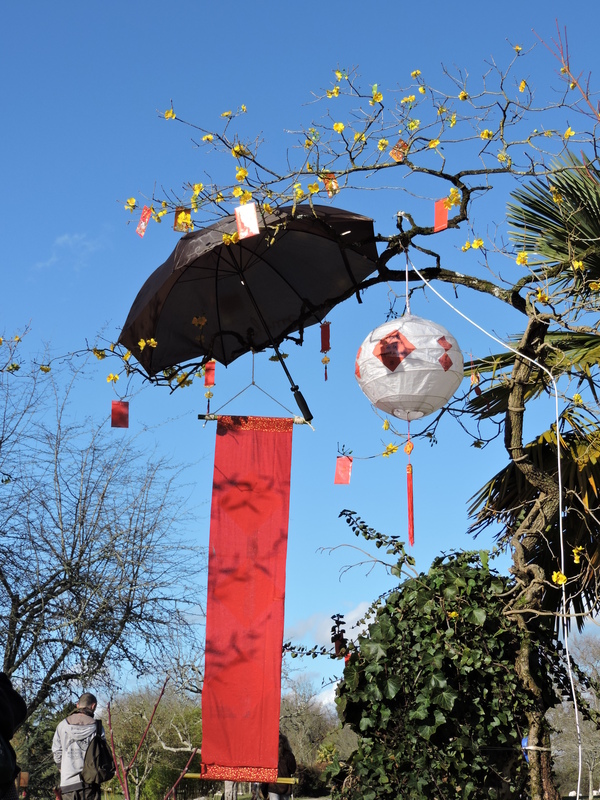 Plum Village : Vietnamese New Year | Between Two Tides. 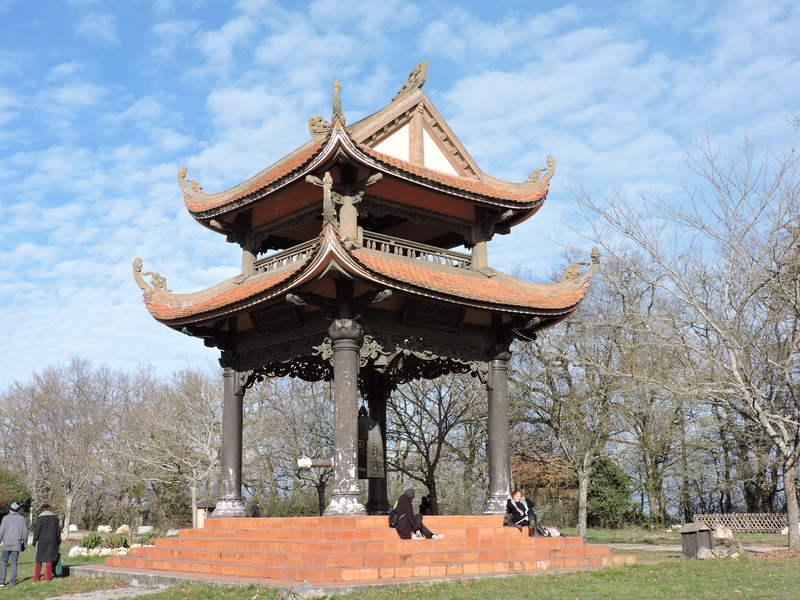 It is the 28th of January, the New Year in Vietnamese culture, and the doors are open to welcome all who wish to visit and enjoy the celebrative ambience within Plum Village monastery, in south-west France. My companions and I remove our shoes outside the doors of the meditation hall, and step through. We are greeted by a large space, with warm wooden floors and walls. Brown mats and cushions are scattered about. My spirit is lifted immediately by the indoor early springtime of blossomed trees, and colourful flowers. The atmosphere is relaxed, children are playing, people chatting, monks sleeping in corners, and thoughtful people sit quietly. We walk toward the altar table on which are placed lit candles and bright potted flowers. 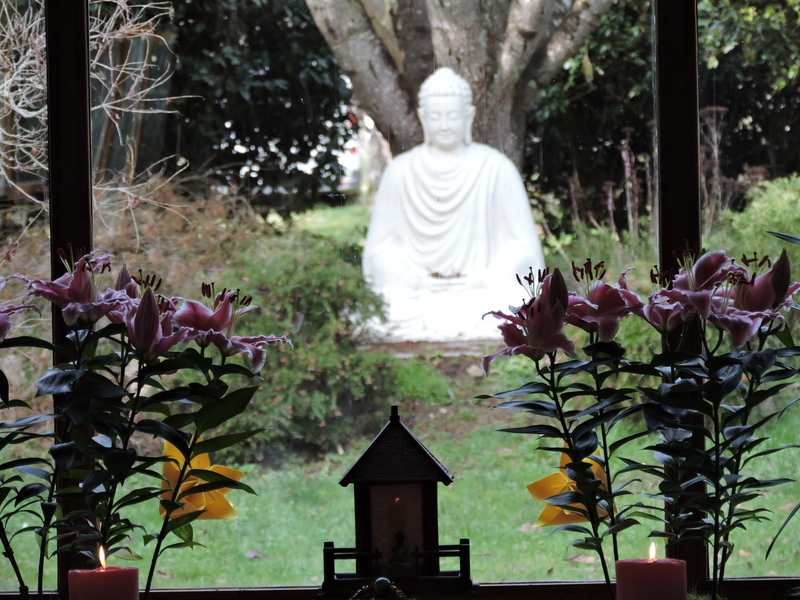 Through the tall, wide window behind is a view of a stone Buddha meditating in a shrub garden. We ask someone what we might do, and are advised to sit quietly and wait for a question to arise within us, then to find our answer in an envelope, that we pick out of one of the three ceramic pots. I have many questions, but eventually I choose and ask. I dip my hand into the pot with english Oracles, taken from the writings of the playwright named Shakespeare, and randomly take a red envelope. I open and read in amazement, for my Oracle writes on the exact theme of my question. Shakespeare quotes, “But that the dread of something after death, it droppeth as gentle rain from heaven”. I am deeply moved. 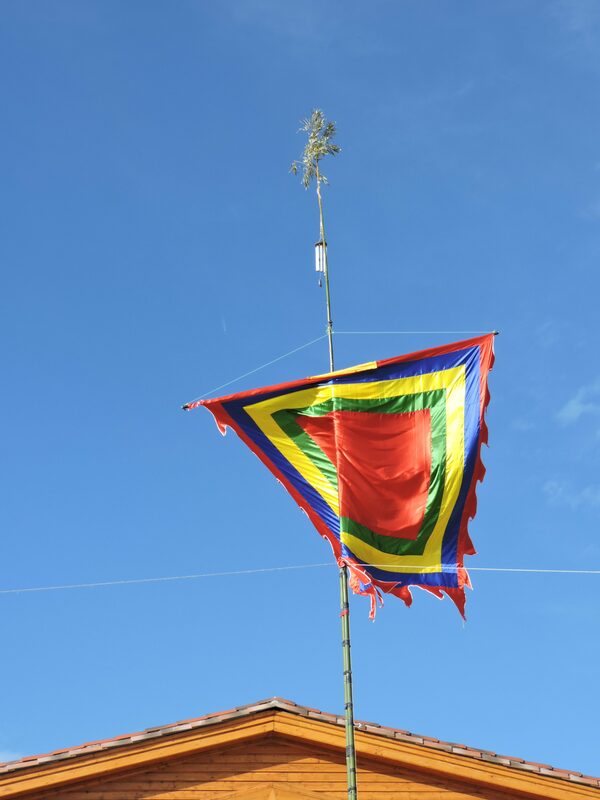 I continue to contemplate the full meaning of this Oracle, as we decide to return to the outdoors, where we are drawn to the striking central building of the village, that is the Temple. We are suitably impressed with its authentic and intricate construction in traditional Vietnamese architecture. But it is not long before our curiosity leads us further along a path toward another low building where many people are walking to and fro. Its entrance beckons through more blossomed trees, decorated with red banners, white lanterns, and envelopes. A gentle breeze plays tinkling music through chime bells. I wonder about the significance of the black umbrellas. I find out later that they promise blessings of protection, and the bringing of peace. Again we remove our shoes before entering the private quarters of the male monks. We pass a library with a large collection of books, a timetable on the wall, and then find ourselves in a pretty garden courtyard where dainty trees lean over a small pool. On its four sides the bedrooms lie, twelve in total, and in each corner, a communal room. The planked walkway is full of people brushing past each other, sitting on its edge, going in and out of doors. Someone, somewhere is playing a guitar. We shyly open one of the doors, and step inside a bedroom. A group of people turn to smile. They sit on the floor in an intimate circle. We quickly determine who are our hosts, as they welcome and encourage us to join them. We learn that we are sitting with three monks who share this bedroom with a fourth. One is Vietnamese, the other two are english, judging by their accents. The room is small, housing four beds, a low round table made with a solid slice of a tree trunk, meditation cushions, a few shelves with tea making equipment, and bits and bobs. We visit for ten minutes, drink tea, eat from a selection of snacks, and share polite conversation, in the english language. The room continues to fill with new visitors, and ours comes naturally to an end. We give our New Year wishes, bid farewell and leave. 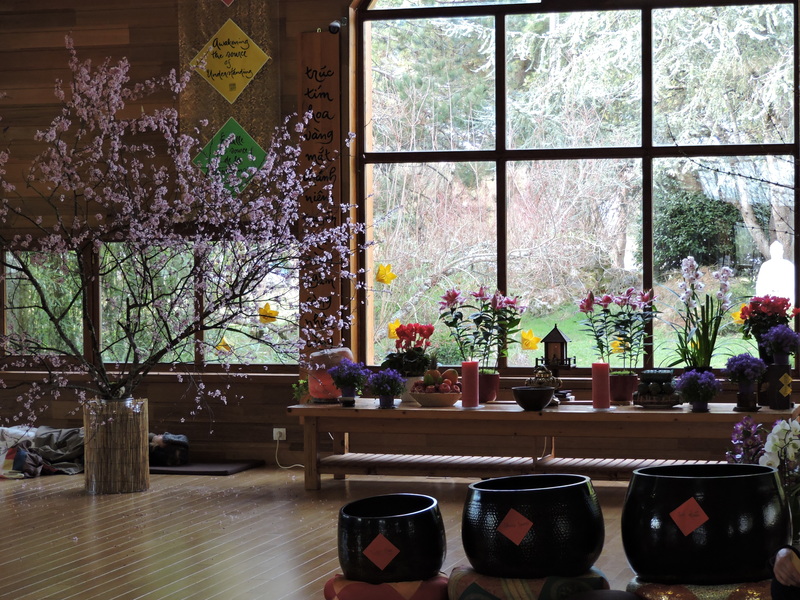 Slowly we amble back toward the meditation room, now openly discussing our questions and answers, and it seems fitting to return to the meditation hall for a few more moments. Inside we delight in the auspicious sight of a Robin flitting between the tree blossom, hopping across cushions, and onto each Oracle pot, in his well-known curious manner. Finally it is time to leave, and on my part, I do so feeling refreshed and peaceful. Thirty five years ago, the Zen master, Thich Nhat Hanh came to the south-west of France to found a Beloved Community, in a Buddhist monastery he named ‘Plum Village’. He created a place “where people could learn the art of living in harmony with one another and with the Earth” (Plum Village website). It thrived and extended. At the present time there are four monasteries separated for monks and nuns, in four different hamlets. In their long brown gowns, with their shaven heads and smiling faces, they are recognisable, yet invisible amongst the french community where they shop, post letters, and drive their cars. One of their monasteries is alongside a road that I use often, and it feels like a blessing to see them gardening, or to wave to those taking their afternoon walks. During certain times of the year they close their doors in retreat. But more often they invite visitors to take rooms, and become part of their commune. In doing so they offer their guests an opportunity for mindful living and rest. This is also how they financially support themselves. Periodically they hold public meditation sessions and lectures. And most enjoyable are their open festival days where they welcome all to eat, talk and play with them. I have visited only twice, but each time, I slip with ease into mindful activity, simply by being there. “Gracious Wishes of the New Year”. How amazing that you spent some time there! I’m pleased to hear from you. Thankyou. I am very moved by this post on so many levels. I need not enter into tiresome detail for you so will simply wish you Namaste and my thanks for the post. Dear Osyth, excuse me for not replying properly sooner. I truly appreciate your comment, because you have read with profound empathy and understanding. Maybe, even more , than I.
Veronica, I liked the way the Oracle sent you a blessing! My Mom was in the hospital with pneumonia three weeks ago. She had wandered outdoors and got sick. It made me sad that no one had noticed while she walked past the front desk. She obviously has some memory loss but I am blessed she is still here. We packed up her senior living apartment and moved her after her healing and therapy strengthened her. She is now safely in a memory care unit. I cried while packing and sorting but now feel a sense of peace and happiness washes over me. It is not the same emotions, but this post meant something to me. Sounds like you had a wonderful experience on retreat at Plum Village, dear. ❤ Your becoming one and in harmony, while slipping into mindful activities sounds very worthwhile. This is springtime in our country and our warehouse of auto parts gears up with many more hours of work. People order parts now online, as well as we send our parts to other stores. Hugs and best wishes to you, my dear V. 💖🙏 Namaste and peace be with you. Thank you for letting me know what is your current state of mind, V. I am so sorry, as I have some sense of loss but not the full devastating one of having loved someone like you did and losing them, too soon. HI! Vronlacroix, how are y doing?? 🙂 been a long time n looks like I missed out on so much of your creation ….. Still mesmerized with the post 🙂 Cheers! Thanks for asking. I’m fine, and hoping to be inspired to post, one day soon. I read this again to gain some calmness and felt the zen given by the members of Plum Village, V.